In Spain, pork, beef, and chicken are often marinated in an adobo, a combination of spices and vinegar. Usually, the adobo combines dry spices along with vinegar or wine and olive oil. Before refrigeration, marinades were very common, since marinating with spices masks any unpleasant flavors, tenderizes, and preserves the meat. When using an adobo, there are a few things you need to keep in mind. First, it is important to wait to add salt until just before cooking the meat since it will draw out the juices. You also want to use a glass or ceramic bowl or dish to avoid a reaction between the adobo and the container. Plastic containers can be used, but are not recommended because the plastic will absorb the color and flavors of the spices. And be sure to refrigerate the meat or fish while marinating to avoid spoilage and discard any leftover adobo in which raw meat was marinated. 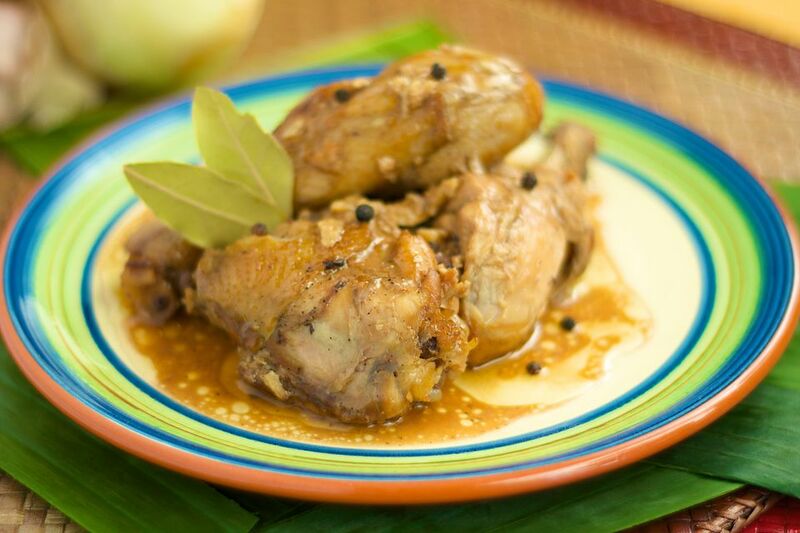 The adobo recipes differ depending on what you are marinating, whether it be pork and red meat, chicken, or game birds. Remember, use the quantities given for spices as a guide and feel free to adjust them to your taste. This marinade makes enough for approximately 2 pounds/1 kilogram of pork or beef. Mix paprika, oregano, and garlic together in a glass bowl or container. Stir in oil, vinegar, and water, if using. Place meat in a container and rub adobo onto all sides of the meat using your hands. Cover tightly and refrigerate for a minimum of 2 hours and a maximum of 24 hours, turning meat occasionally to coat all sides. This adobo is good for roasted or grilled chicken and makes enough for 1 whole chicken. Finely chop basil leaves and hot pepper. Mix chopped basil and hot pepper with the rest of spices in a bowl, and then rub onto chicken using your hands. Coat all surfaces thoroughly. Drizzle olive oil over chicken, a bit at a time, continuing to rub chicken with your hands. Squeeze lemon juice (or drizzle vinegar) over chicken. Allow to marinate for 20 minutes to 2 hours. Roast or grill chicken. This adobo is good for wild birds, such as quail and pheasant. Crush the bay leaf and garlic in a mortar and pestle (or with the side of a knife), and place in a glass bowl large enough to fit bird(s). Add the rest of the ingredients and allow to sit for 1 hour. Add bird(s) and marinate for 1 hour in mixture, or use it to baste while grilling.